Sequels come with expectations. None more so than a book that follows a predecessor that ended on a moment of change. Fool’s Quest is Robin Hobb’s sequel to Fool’s Assassin, which I reviewed last year, and that book ended on something of a cliffhanger. Meaning my expectations for Fool’s Quest were high, if not very particular. Before you read on, know I’m going to spoil Fool’s Assassin so I can discuss Fool’s Quest. If you haven’t read Fool’s Assassin or really any of Robin Hobb’s books then check out the review I wrote. You’ve been warned and really should also consider yourself chastised for not having read any of Robin Hobb’s previous books. I came to Fool’s Quest thinking this would be the fantasy novel equivalent of Taken, the Luc Besson action film starring Liam Neeson. Here is a man, FitzChivalry Farseer also known as Fitz, who has a particular set of skills much like Liam Neeson’s character. And both of them have had their daughters kidnapped, warranting an extreme response. Or at least I was hoping for an extreme response, because Robin Hobb’s writing is at its best when she’s putting Fitz into dangerous situations. The most disappointing aspect of Fool’s Quest is the inaction on everyone’s part. Bee, Fitz’s daughter has been stolen, his home invaded and life turned upside down and yet everyone he knows is cautioning and pushing restraint. The one exception is the Fool, who knows the people that stole Fitz’s daughter, and is asking Fitz to seek bloody vengeance and wipe them off the map. The Fool’s request is the titular Fool’s Quest and in over 700 pages little of said quest is accomplished. What does happen is world building, excellent world building as only Robin Hobb can. She lays down line after line to form a web connecting the Six Duchies to the wider world not just with current events but through the history of the world. And given the previous three trilogies, one quadology and Fool’s Assassin, for a total of 14 books, that’s a lot to tie together. It’s safe to say I’m invested in the world of Fitz and the Fool. But for anyone who has read at least a few of these books before Fool’s Quest and its predecessor, these might be hard books to pick up. In previous gabapentin to buy online volumes, Robin Hobb could readily make years pass in a number of pages with the reader easily accepting that passage of time. This go round, it takes 500-some pages for a week to pass. Fool’s Quest picks up speed in the final 200-plus pages which is great. Fitz and the Fool finally set off to seek vengeance and in doing so are once again changing the world as they touch it. Along for the ride are a number of new characters introduced during the previous book, Fool’s Assassin, who change up the dynamic of the Fool and Fitz. That change is welcome, given the previous two trilogies starring them kept to the same formula for both series. Robin Hobb has written two books that have been setting up a great story of adventure and revenge. Fool’s Quest is the culmination of that. Fitz and the Fool are on their way to drawn blood, and my hope is the third book will give us that, because it’s a shame to see such a great writer falling prey to the same issues that have plagued others like Martin or Jordan. Their books have gotten longer while the plots have slowed, and Hobb could readily be joining them in this trend. I hope not. 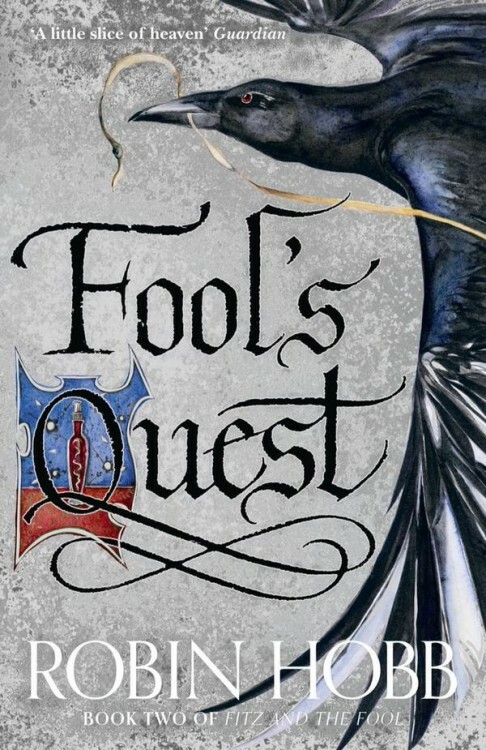 As ever it comes down to the question of whether or not you should read Fool’s Quest — the answer, of course. It’s an excellent story and well told, plus if you’ve read any of Robin Hobb’s previous works you’re as invested in the world of the Six Duchies as I am. Just be prepared for a commitment to over 700 pages and a forth-coming sequel. Gregory Pellechi used to work in the Middle East and Southeast Asia but now calls Finland home. He wishes he had more free time to read and write – the latter of which he does far too little of for himself. Greg will read just about anything and these days that includes books (albeit easy-readers) in Swedish, but prefers Cyberpunk, Speculative Fiction and Star Wars. You can visit his blog at www.gregorypellechi.com where he runs the podcast Fulltime HEL. He’s also on Twitter (@SvenNomadsson); just remember the time difference if you’re expecting a prompt reply.